Schools and other educational organizations can schedule Amateur Radio contacts with crew on board the ISS through the ARISS program. 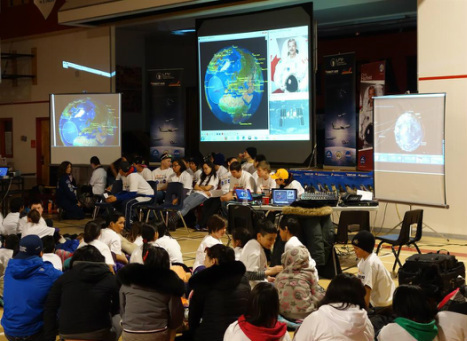 Astronaut Chris Hadfield, KC5RNJ/ VA3OOG spoke to students at Maani Ulujuk High School in Rankin Inlet, Nunavut, Canada in April 2013. Schools and other educational organizations may Apply to Host a Scheduled Contact with the ISS through the appropriate ARISS regional representative. Find out where, when an how many ARISS scheduled contacts have been conducted with schools and in other venues around the world. Search our database. Astronaut Sunita Williams. KD5PLB, speaks to students during a school contact. a TELEBRIDGE, where a dedicated ARISS amateur radio ground station, located somewhere in the world, establishes the radio link with the ISS. Voice communications between your students and the astronauts are then patched over regular telephone lines. One of the goals of this program is to involve students with amateur radio and to provide an opportunity to learn about radio science. A direct contact will give your students an opportunity to speak via amateur radio and learn how the radio system works. If your school has an amateur radio station that you plan to use for a direct contact, then the station must meet certain technical requirements to offer a good experience for students. Please refer to our recommendations for a suitable ground station equipment configuration. If you do not have a station at your location, then you may be able to work with a local ham radio club to have them temporarily install and operate a portable station at your school. Local amateur radio volunteers may also be to offer some instruction about amateur radio, radio science and satellite communications to students. Schools and educational organizations selected for a scheduled amateur radio contact through the ARISS program are assigned an ARISS Technical Mentor to help them prepare for the contact. ARISS Technical Mentors are amateur radio volunteers located around the world who support the ARISS program. They help to coordinate the logistics of an ARISS contact and will advise the school and local amateur radio volunteers through station configuration issues to prepare for a direct contact. If you are unable to support a direct contact then a telebridge can also be a very rewarding experience for students and the school community. ARISS Technical Mentors will also be able to advise you on logistics and equipment needed for your situation. For either direct or telebridge contacts, please work with your local amateur radio operators to make arrangements suitable for your situation. Decide if your school will apply for a direct or a telebridge contact. Students at Burns Science and Technology Charter School in Oak Hill, FL had a conversation with astronaut Sunita Williams, KD5PLB on September 13, 2012. 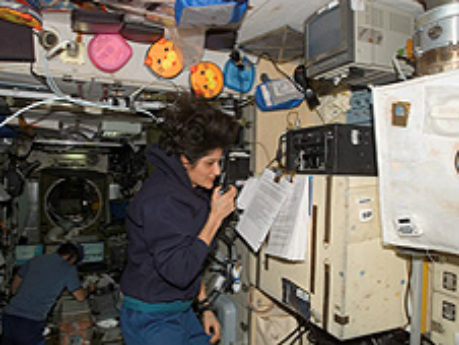 Students of Windsor Central School District and Owego/Apalachin School District contact Col. Doug Wheelock on the International Space Station (ISS) using Ham Radio on September 22, 2010. Some scheduled contacts are accessible to more than the local audience in attendance when the amateur radio ground station is configured to offer IRLP and/or Echolink transmission of the conversation. These modes are available to licensed radio amateurs around the world. Some schools make arrangements for live Web streaming of their contact. If offered, when advance information is provided by the organization hosting the contact, details for IRLP and Echolink connection and/or the Internet URL for a Web stream will be included in the announcement of Upcoming Contacts. For a list and links to multi-lingual informational ARISS websites hosted by ARISS partners, click here. NASA has a library of materials and resources for educators. You'll find information about payloads, missions and space science to develop a learning experience for students in preparation for their conversation with an ISS crew member. The European Space Agency (ESA) has materials and lesson plans for educators. Information may be obtained on education projects that are developed around specific missions of ESA astronauts. Websites of the ARISS Amateur Radio partners are also a source of information about the science and technology of radio communication and satellite communications. Some also provide educational materials that can be used in the classroom to teach students about the mechanics of the amateur radio contact with the ISS station. Your ARISS Technical Mentor will be able to direct you to these resources. Forms and other informational resources needed to execute requirements for scheduled contacts are provided on our resource page on this website. Find out where, when an how many ARISS scheduled contacts have been conducted with schools and in other venues around the world.